Islamabad: Pakistan summoned an Indian envoy to formally complain on Thursday about alleged violations of its airspace as it sought to deflect heat from the deadly Mumbai terrorist attacks onto its longtime rival. Pakistani leaders had previously downplayed the alleged breaches by Indian aircraft, calling them “technical". 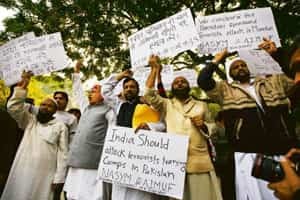 But after days on the defensive over signs that Pakistani nationals staged the attacks that killed at least 183 in India’s commercial capital, Islamabad appeared to be taking a more aggressive tack. On Wednesday, Pakistan stepped up demands that India show evidence to back its claims that a Pakistani militant group trained and sent the gunmen, saying court prosecutions would be impossible without proof. Indian deputy high commissioner Manpreet Vohra said on Thursday that he will pass on the complaint over the alleged airspace violation to his government, but he noted previous Indian denials. “Our government, after holding an inquiry, has already said that there was no airspace violation from our side, and I reiterated this stance today," Vohra said. Pakistan had said earlier that the two separate violations occurred on Saturday over the eastern city of Lahore and Pakistan-controlled Kashmir. The Indian aircraft allegedly flew 1-3 miles into Pakistan. Pakistani fighter jets chased them back over the border, according to the Pakistan Air Force. In a statement on Thursday, the foreign ministry said “technical and airspace violations" occurred on Friday and Saturday, violating a 1991 bilateral agreement. It did not elaborate and a spokesman could not immediately be reached to explain the discrepancy. Pakistan and India are both nuclear-armed nations who already have fought three wars against each other. The Mumbai attacks have strained diplomatic relations and halted an already slow-moving peace process between the countries. India says the Pakistan-based Lashkar-e-Taiba militant group was behind November attacks. Pakistan has arrested some suspects and clamped down on a charity allegedly linked to the outlawed group, but it insists it needs evidence from India. Asked about that demand, Vohra said on Thursday that India “will do it only once our investigations are complete". Meanwhile, former and present Pakistan cricket players expressed disappointment on Thursday at India’s decision to cancel its tour to Pakistan, fearing it could harm the game in the region. The Indian government has advised its cricket authorities not to proceed with next month’s scheduled visit in the wake of Mumbai terrorist attacks. “It’s a big disappointment and a setback to Asian cricket," former Test fast bowler Sarfraz Nawaz said. “The terrorism acts could happen anywhere in the world, but that does not mean that sports activities should come to a halt." Within the political power structure of the game, there had been co-operation between India and Pakistan despite the difficult relationship of the two nations. However, Thursday’s decision threatened to harm that solidarity. “Once we thought Asia will be a strong bloc in the International Cricket Council, but if we don’t play against each other in our respective countries how could we become stronger?" Nawaz questioned.